This week, we talk live with Kevie from Unseen Studio about his new community podcast project, CCJam. Plus we play our usual mix of fantastic music. 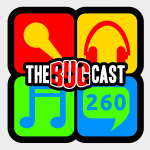 The next show will be episode 261, which will be broadcast live in the chatroom on Friday 10 May 2013 from 21:30 UK time (UTC+0100).